The origins of our district's name are fairly obvious and well known - the details, less so. In this article we attempt to piece together sometimes conflicting historic accounts to provide a likely, and perhaps controversial, version of the full story behind "the gate". The Forest Gate was located roughly between what is now the Lord Lister clinic and the former Eagle and Child pub (now Woodgrange pharmacy) on Woodgrange Road. There was no metalled road during its lifetime, simply a track - and "the gate", was principally an attempt to prevent cattle straying from "The Forest of Essex" (the lower part of which is what we now know as Wanstead Flats) on to the meadows and orchards of the Woodgrange, or on to the main Colchester to London (now Romford) Road. Forest Gate's earliest appearance, by name, in surviving records, appears to be in the mid seventeenth century, in the West Ham burial register, which refer to the internment of Martha Jordon, from "the house of William Hare of fforest gate ... Monday ye 9th of April 1655". To suffer William Hopkins to enclose two acres near Wood Grange gate, within the said forest, and also give him licence to erect a dwelling house thereupon. Eighteenth century maps appear to confirm the existence of "the gate". The Survey Map of John Rocque (see below for an extract), published in 1746, somewhat confusingly calls Woodgrange Road, "The White Gate", and William Hopkins property between Woodgrange Farm and The Eagle and Child pub is labelled "The Red Gate", but the location of the forest gate does snot seem to be indicated! 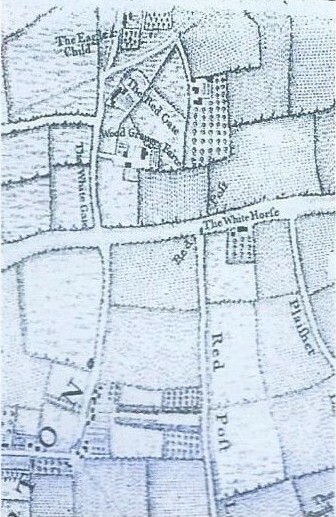 Andre and Chapman's map (see below for a small detail), published some thirty years later, seems to show "the gate", close to the Eagle and Child pub. 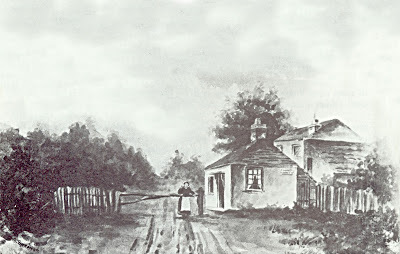 A local family historian has discovered that "three tenements on the north side of the Eagle and Child in Epping Forest" were insured with Sun Fire Insurance, in 1837, by a Robert Clayworth, who was a poultry farmer of Whitechapel. It looks therefore, as if the area adjacent to "the gate" was farmed by poultry keepers, who sold their stock in the City's Leadenhall Market. 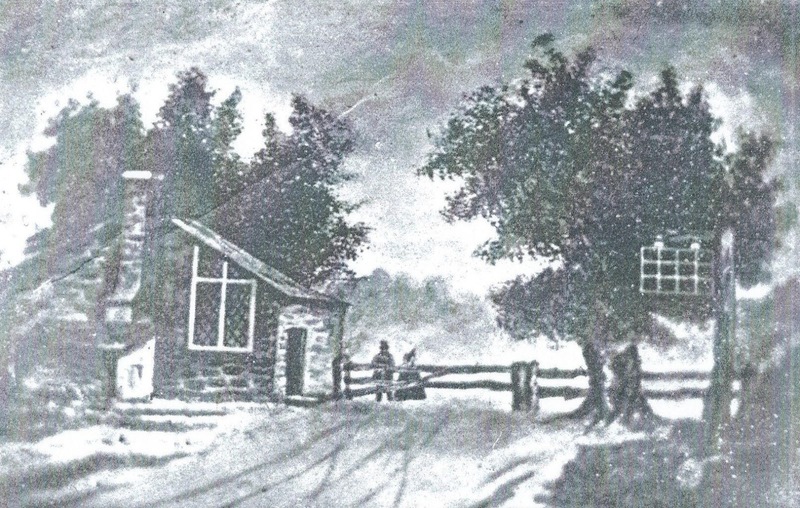 Martin Wallace, in his history of St Mark's church, published in 1986, says that the original gate was replaced in 1851 by the Lord of Woodgrange manor, who erected a new five-bar gate, together with a keeper's cottage - known as Forest House. The present article reproduces 6 drawings of "the gate" and its surrounds, but only the last of them shows the five-barred gate. The others illustrate the earlier, rickety ,older, and perhaps, original one. Twentieth century commentators (see below) assert that it was not a toll-gate, and this version has become the received wisdom since. But the evidence, published in a facsimilie of its original form for the first time here, seems to dispute this claim. The 1851 census, for example (see extracts below) describes a 68 year-old Robert Baker, born in Dagenham , to be living at "Forest Gate Toll House" and as being a "toll keeper". Why the use of the word "toll" twice in this contemporaneous census entry if "the gate" in question were not a toll-gate? Being famous locally for his association with footpads, highwaymen, gypsies and poachers, who used barbaric traps to catch their prey. (We) and several other authorities doubt if the Forest Gate was ever a toll gate. 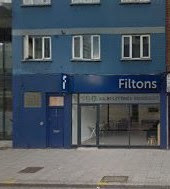 ... A draft Ordnance Survey about the same time (1851) places a "toll gate" across the road at that point. 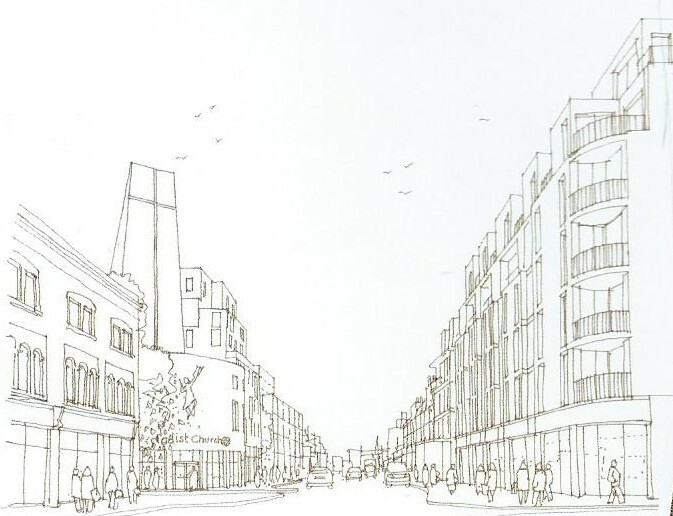 It is possible that, with the development of the neighbourhood tolls may have been temporarily charged for the upkeep of what became Woodgrange Road until the Local Board (ed: predecessor to West Ham Council) took over the highways (ed: probably in the 1870's). This would make complete sense - charging travellers for the use of a half decent road to and from the forest before there was a formal publicly funded mechanism for paying for the maintenance of public highways. The 1851 pen and ink drawing, below, is titled "Ye olde toll gate" - a strange name for a contemporary to give his work if "the gate" were not, in fact, a toll-gate. 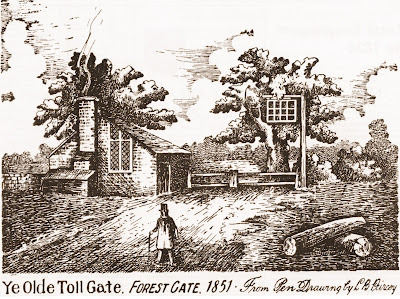 1851 pen and ink drawing of "Ye Olde Toll Gate"
I do not remember the gate ever being closed. It was set back against the wall of the cottage, but anyone who wished to could have closed it. In my childhood (ed: the 1850's), when we dropped by, the woman in charge would come to the door and catch the penny we tossed her. This extract does not prove "the gate" was a toll-gate, but why else would a passer-by throw money at a person standing next to it? Unfortunately, Ordnance Survey maps of the period are not very illuminating. 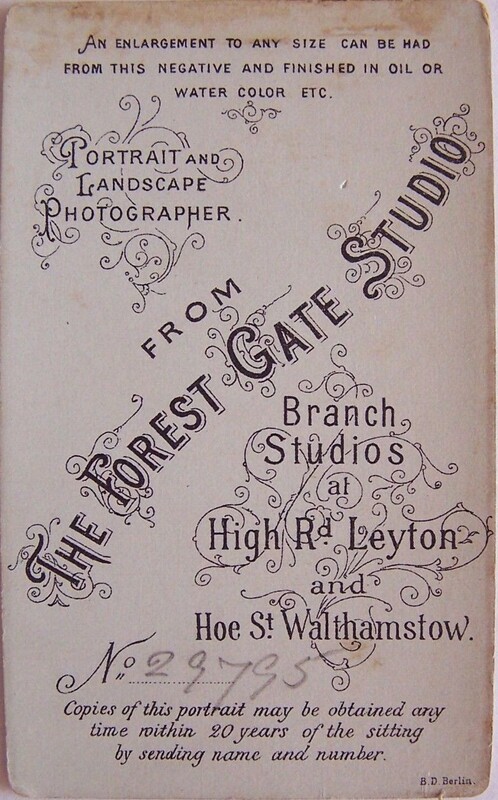 The 1863 OS map of Forest Gate and district appears to be cut off just feet from where "the gate" was located - and so can't settle any controversy. 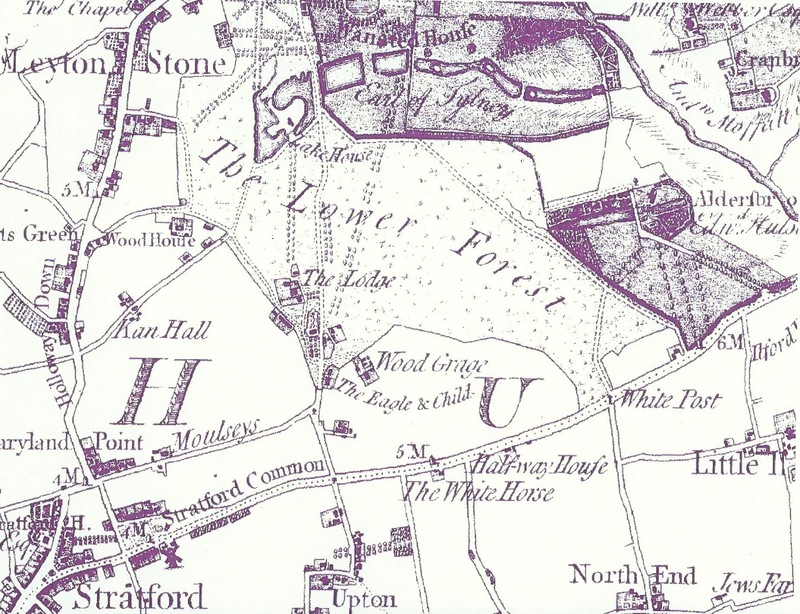 A larger scale, 6" map, indicates what is now Woodgrange Road ran to the Eagle and Child, and not beyond suggesting that although not formally a "toll road", tolls were collected by the toll-gate keeper to pay for the upkeep of Woodgrange Road, from Romford road, to the pub. The next event in "the gate's" history, for which records remain, is the earliest (only?) 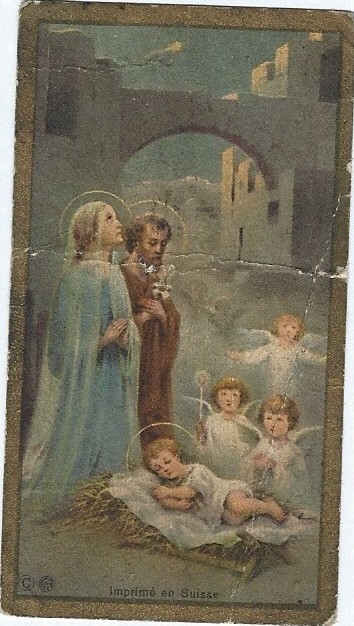 surviving photograph of it. The occasion was a visit of Princess Louise (Victoria's 6th child and 4th daughter) through the district around 1876, on her way to a charitable event in Essex. The photo was taken before the Eagle and Child pub was re-fashioned, in 1896. 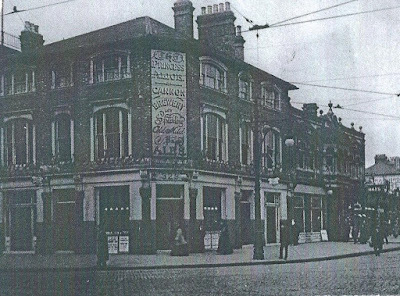 The old pub is at the back of the photo and the building attached to it, in the foreground, was a butcher's shop - see below. The gate is clearly open, but would have stretched from post, on the roadway, to the left of the photo to the lamp-post on the right. 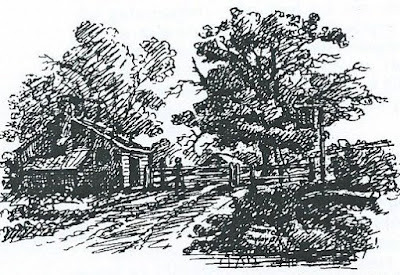 Only some twenty years ago the Eagle and Child was the hostelry of the district; its gardens, with summer houses and statuary were much sought out for rest and refreshments by persons passing by, or strolling through the forest. "The gate" unfortunately is not in view. 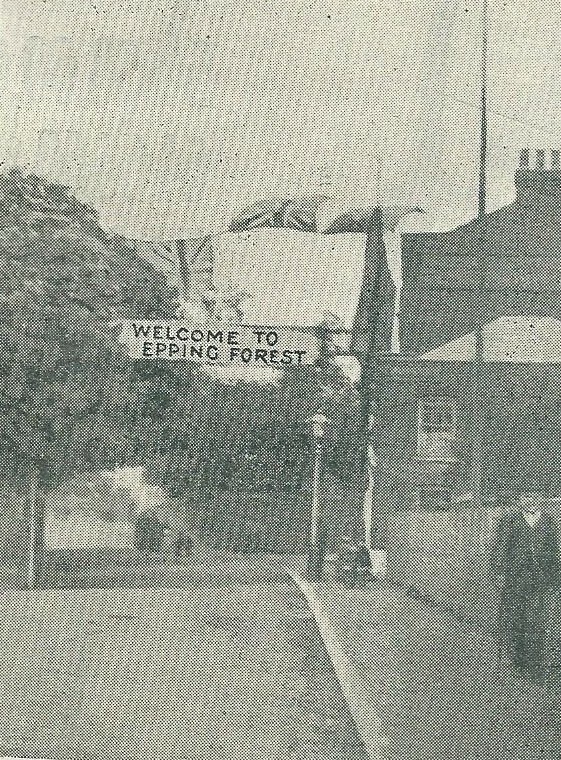 There are still (1896) residents among us who can remember the old gate and the little toll booth (ed: our emphasis) by which alone from this part of the country, communication was had with the Forest from the high road, from Ilford to London ... it was necessary first to pay the gate keeper, who eked out his slender honorarium by the sale of cakes, nuts and ginger beer. 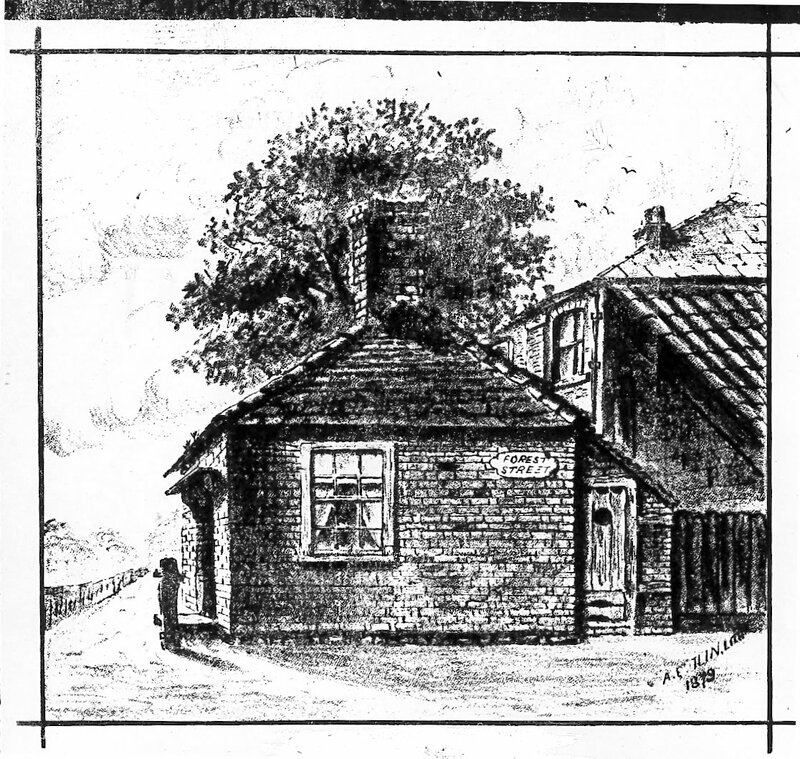 On the south side of the gate there were but a few houses then, one occupied by Mr Castell (see below) and another by Mr Baker (ed: what relationship, if any, this person had to the Robert Baker, above, is not clear) on the east side, and some small cottages on the west side, were all the buildings that were near the gate. The Mr Castell the Weekly News refers to appears in the 1881 census as George Castell, a 45 year old dairyman, living at Sunny Villa ("Mr Baker" does not appear living nearby in these census returns). 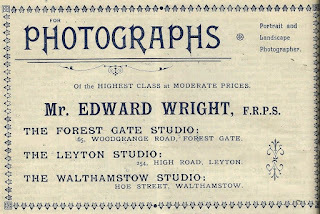 Doubtless, George Castell supplied, if not owned, the butcher's shop, featured in the banner photograph of "the gate", above, and probably herded his cattle on Wanstead Flats. 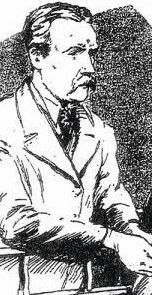 George Castell lived with his wife and seven children in the house in 1881. In the next census, a decade later, he was described as "retired" and was living at 62 Capel Road. 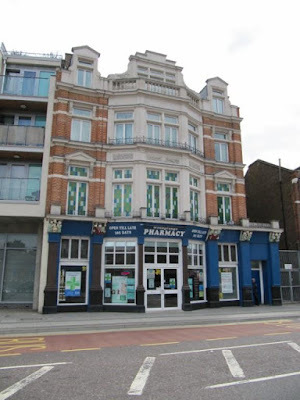 The Weekly News reported in 1896 that the houses that the Baker and Castell families lived in were still standing, but by now "they are hidden by the sight of the shop fronts that were added to them years later "- rather as those further down Woodgrange Road are today. 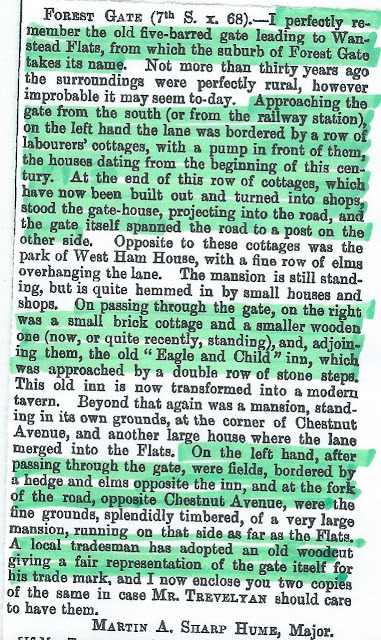 So, the Weekly News, writing of the 1870's mentioned a toll-gate, but also writing of the 1870's, an old West Ham resident, Major Sharp Hume penned a vivid description of his recollections of "the gate" and its surroundings, in Notes and Queries thirty years later (see the facsimile reproduction, below). 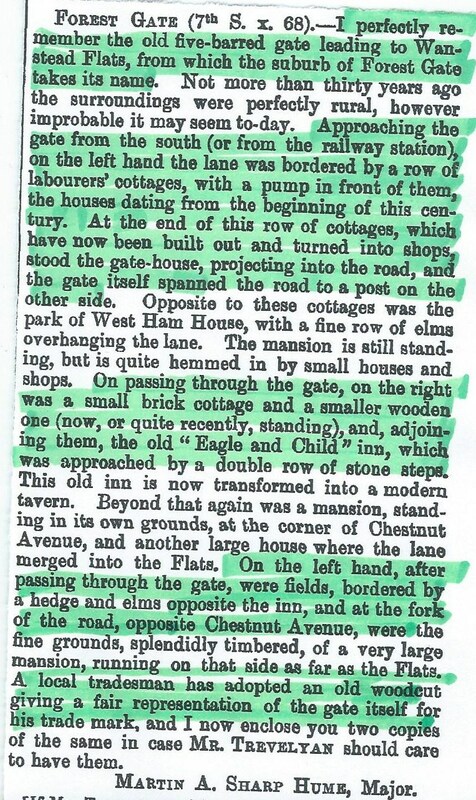 The highlighted sections clearly mention "the gate", but not as a toll-gate, suggesting, perhaps that the West Ham Board had by then taken over responsibility for the road and no longer charged travellers for using it. It could be deduced from the above that perhaps the tolls were no longer charged from the late 1870's - as some with recollections of the early years of the decade recall the tolls, and those remembering the later years of the decade don't. From time to time, imposing, even royal cavalcades, principally hunting parties, or visitors to Wanstead House (ed: see here for details of the House's history) passed through the gate and imperfect records of their pageants were handed down from generation to generation of gate-keepers, but for want of a local historian to reduce them to writing, much that would otherwise be entertaining reading would be lost to us. The hamlet situated beyond the highway, known as Forest Gate ...used in its former years to consist of only two or three gentlemen's houses and the little wooden hut occupied by the keeper of the "gate to the Forest", which was generally shut, to prevent cattle straying from Wanstead Flats to the High Road. And, that's it! 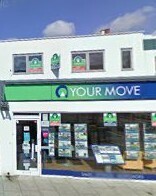 E7-NowAndThen's verdict on their history of the area of their residence: poor show! Most commentators and historians agree that "the gate" was demolished sometime between 1881 and 1883. This is just three or four years after the Corporation of London took over responsibility for Wanstead Flats and after the West Ham Local Board would have taken over responsibility for the upkeep of Woodgrange and Woodford Roads. The proximity of these events is probably not coincidental. 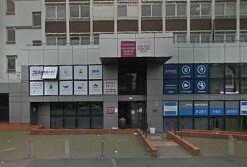 Within fifteen years the sands of time, however, had blown over much local memory of "the gate", with the Weekly News commenting :"of its ultimate fate, we have no information." The old gate house at the corner of Forest Street (ed: now Brooking Road) was never a toll-house, but the residence of the keeper of the gate, which was placed across the road to prevent cattle straying off the Flats on to the highway. And that has become the accepted version of the story: a forest gate, but not a toll-gate. A crude chronology of "the story" of "the gate" would be, that nineteenth century witnesses declared the gate to be a toll-gate, and twentieth century "experts" dismissed the observations as fanciful. Perhaps revisionism is in order today, and we go back to believing the contemporary witnesses. Piecing the evidence together, the following seems at least to be a plausible account of "the gate's" history. A gate was in existence, on what is now Woodgrange Road from, at latest, the mid seventeenth century. 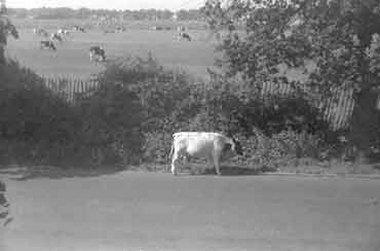 It was there to keep cattle straying off what we now know as Wanstead Flats on to nearby arable and orchard land, and the main London to Colchester road. It could well have been erected by the Lord of Woodgrange Manor to protect his crops from animal damage. He may well have charged a toll for the grazing animals to pass through the gate, on their way to market in central London, by way of recompense for the damage their hooves would have done to the road he maintained, en route to Smithfield. 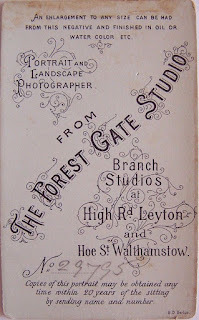 Forest Gate began to develop as a settlement of some importance from the 1840's. 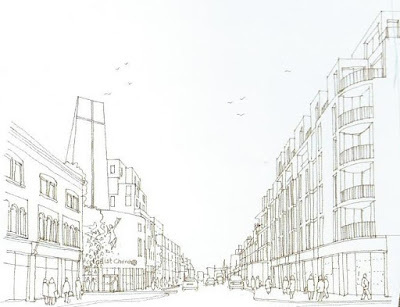 This would have brought an increase of passenger traffic along Woodgrange Road, into Leyton and further points north. The old gate clearly, as illustrated by some of the sketches in this article, suffered from disrepair . 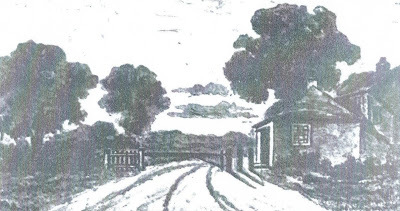 In 1851 Samuel Gurney (see here) bought the Hamfrith estate, including the "lordship of Woodgrange Manor" (see above)and immediately erected a new main gate with the side, five bar, one, referred to above. He also appears to have built a gate-keeper's house - whose occupants would assist both foot and carriage passengers, while still preventing stray cattle wandering. 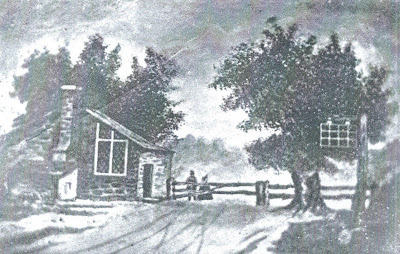 The gate-keeper, gate and road would all have required maintenance, A toll was charged, to cover, or at least contribute to, the costs of the upkeep of the road, gate and keeper. 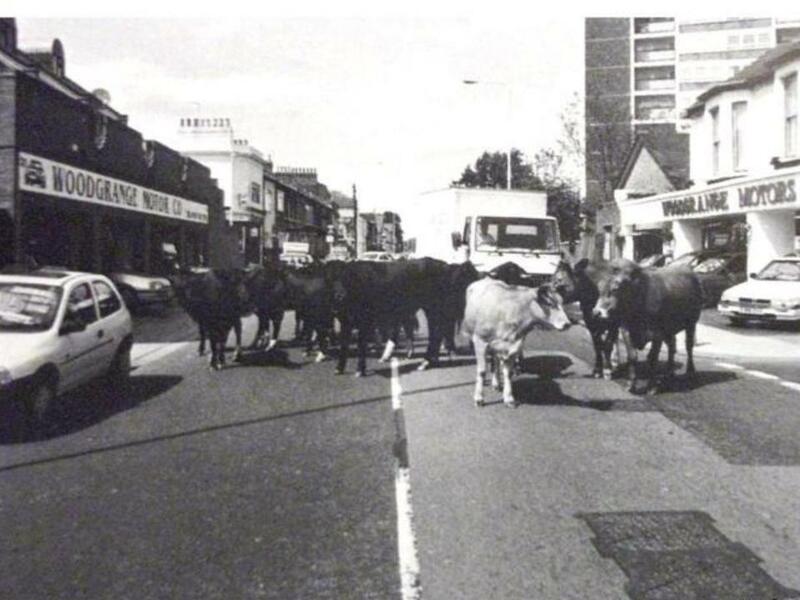 When the West Ham Board took over the upkeep of the road, they would have abolished the toll, and made the toll-keeper redundant, but kept "the gate" to keep the cattle at bay. This, however was removed in the early 1880's, as it would have become a serious impediment to the increased volume of traffic. Cattle subsequently resumed their wanders from the Flats down what was by then Woodgrange Road (see photo), as they would for the next century, until an outbreak of BSE finally stopped cattle grazing on Wanstead Flats in the 1998. Footnote: We are deeply indebted to local post-card collector and photographer, Tony Morrison, for the use of some his high resolution images to illustrate this article. 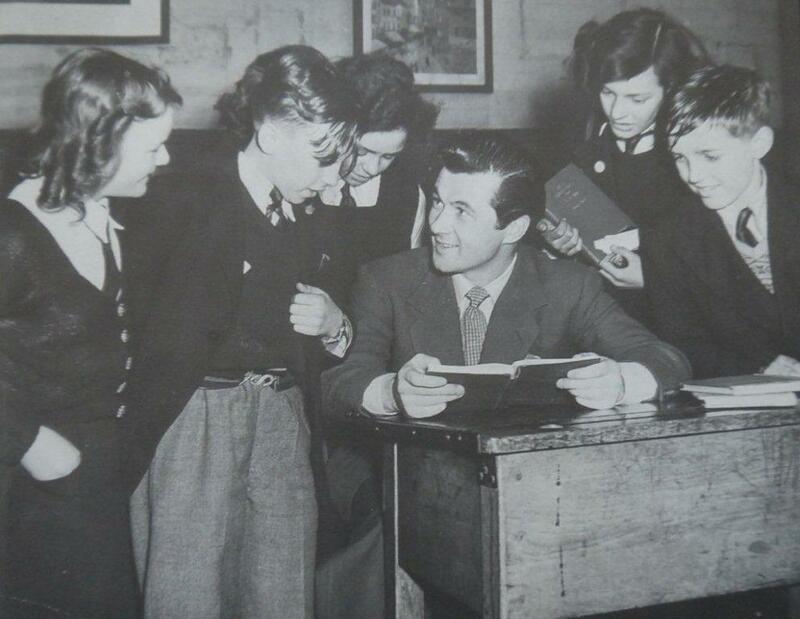 We hope to be working with Tony to provide other images from his fine collection in future articles on this blog. One of the delights of running this website is that sometimes articles can prompt replies and memories that can add colour and flavour to our understanding of the past. One such correspondence was provoked by our article on the history of the Princess Alice (see here for details). 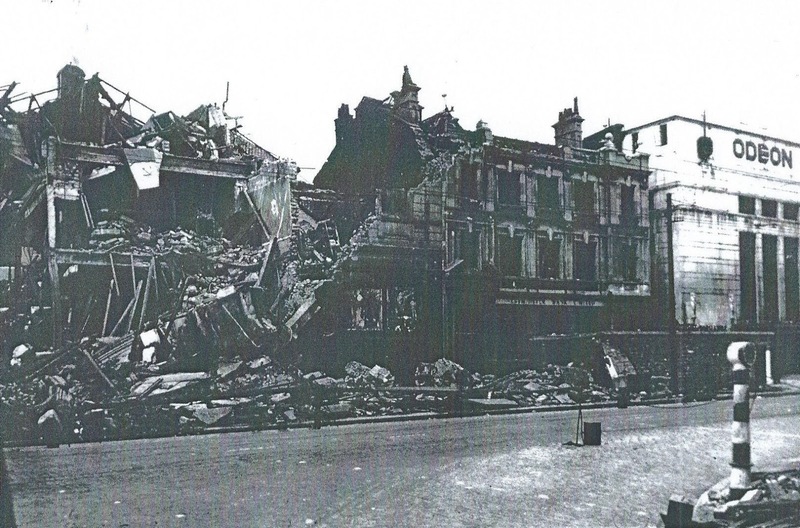 Reader, John Muskett was in the pub the night of the bombing. 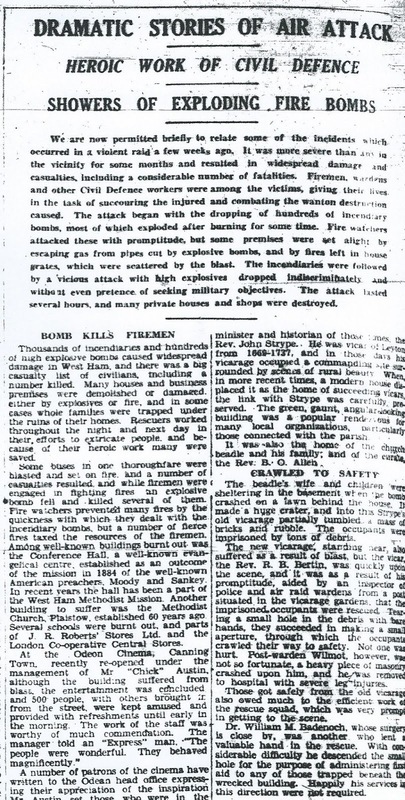 We are posting this article on the 77th anniversary of the bomb - 20 April 1941. 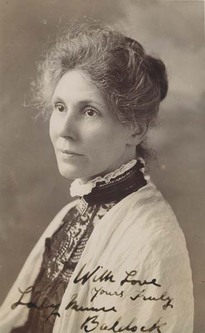 I was guided to your web site and was sad to hear that The Princess Alice is no more. 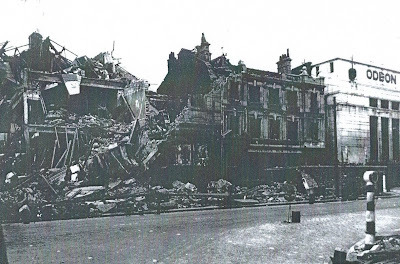 I was actually in the Princess Alice at the time of the bombing and wanted to show my eldest son something about it. 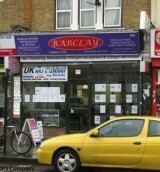 The Landlord at that time was Mr Albert Smith. His wife, Violet, was my mother's sister. 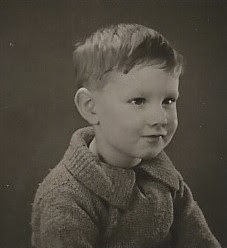 I lived with my maternal grandparents, - as my mother had died a year or so before. Another aunt lived with us, but our house had been bombed and we were, homeless at that time. We lived, temporarily in the pub for a while, until we were rehoused. The cellars of the Princess Alice were very extensive, at least they were as far as a 5 1/2 year old was concerned. One of them rather resembled a hospital ward, being surrounded by beds. My aunt and uncle giving any passing serviceman without somewhere to go, a bed for the night. I was down there we were when the bombing happened. The Head Barman also lived in the pub and had been in the cinema - see photo of bombed Queen's cinema, below - on which the bomb actually dropped, the fall-out from the explosion hit mainly the front of the Alice - opposite. I remember the head barman being asked how many people he thought may have been in there, by a fireman leaning on a felling axe. That was something that must have impressed itself on me as I cannot think why my memory of that particular incident should be so clear after all these years. I also remember the next morning when we had to pick our way over all the bricks and rubble to get out and I picked up the top of a soda syphon which I had for a great many years afterwards. by what John says was collateral damage. The death of the man you mentioned (ed: killed while out walking his dog) has always served to remind me just how simple decisions and luck can make a difference to life and death. 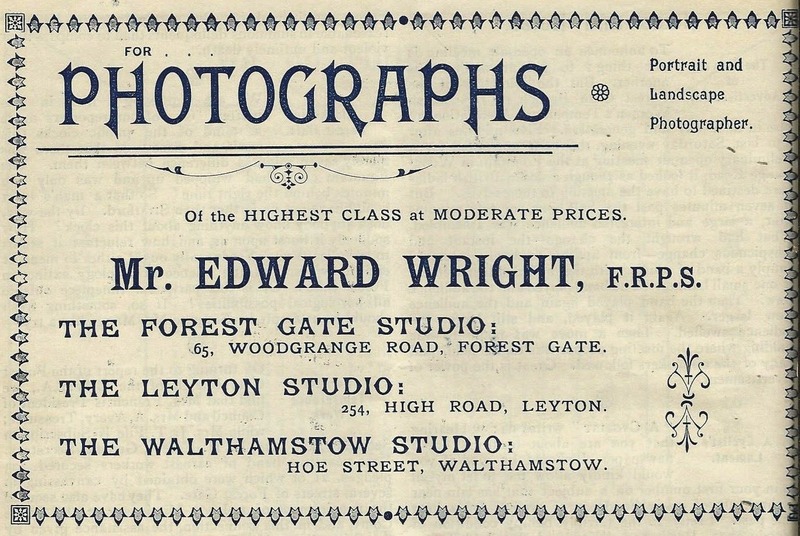 He was the dentist who lived next door and came in to us for shelter when there was an air raid (ed: according to the West Ham register of the WW2 civilian dead register, this looks like it would have been Herbert Emile Kaye, aged about 60 of 1 Woodgrange Road). 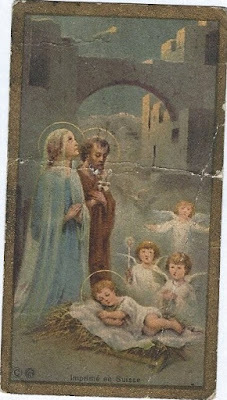 On the night of the bomb, he chose to come just when the bomb exploded, and he was still in the street when he was hit. I was told that he was blown through the flaps in the pavement where the beer would have been lowered into the cellar, and was found in the cellar next to the one we were in. How true that was I cannot say. 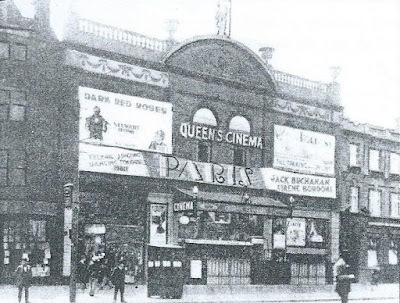 Some years later - I think maybe in the 70's or 80's - there was a report in one of the evening papers that the ghost of the dentist had been seen in the Princess Alice. When I told my aunt, she said he was looking for her, as she had paid a deposit for some new dentures and never had either the dentures or her deposit returned! There is just one question I would like to ask you if I may. I know I went to school while I was there, although not for any great time. 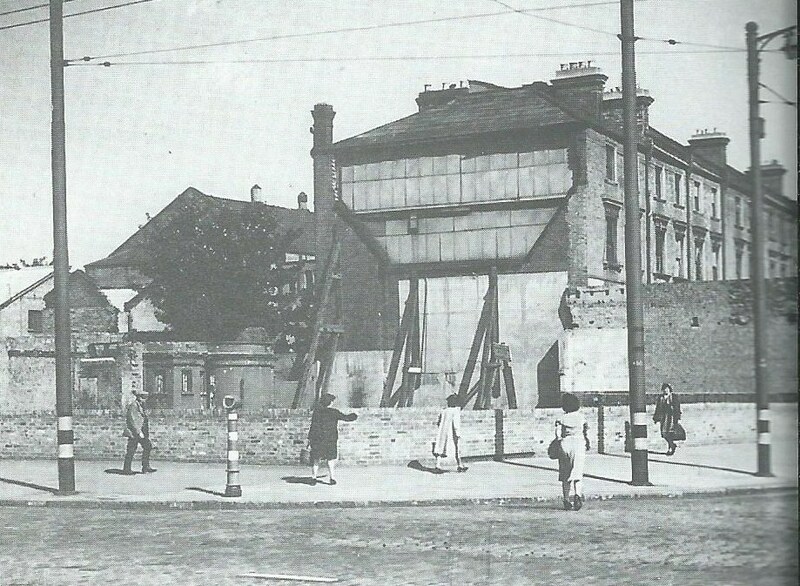 It was a small school, in possibly a couple of houses in one of the streets close to the pub. It was certainly within walking distance and run by nuns. Quite why I went there I do not know, as we were not Catholics. 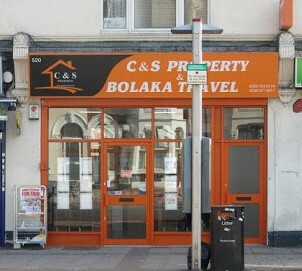 I assume that it is no longer there but would appreciate it if you could confirm that for me. (Ed: I'm afraid we cannot help you with an answer to your question, John. It sounds as if the sisters may have been some that stayed in Forest Gate after St Angela's school evacuated to Norfolk. 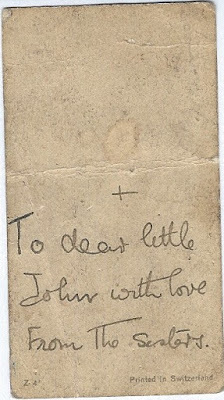 John seems to think the school may have been in the Earlham Grove/Norwich Road area. Perhaps one of our readers can assist, and post a comment, below?). 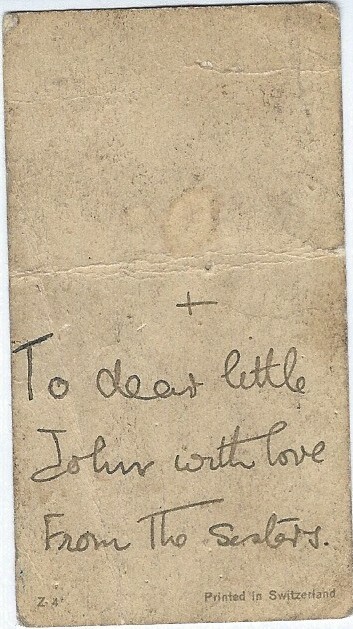 I still have a small card inscribed, To dear little John from the Sisters. 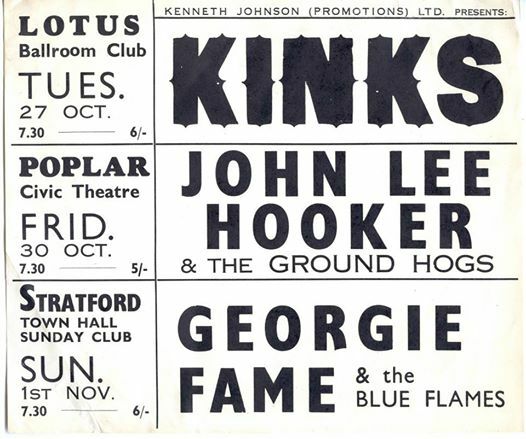 As you will no doubt have realised, I am now in my eighties and, like so many older people, I so often think back to the times past. I find myself constantly surprised by the trivial little memories that come to mind. 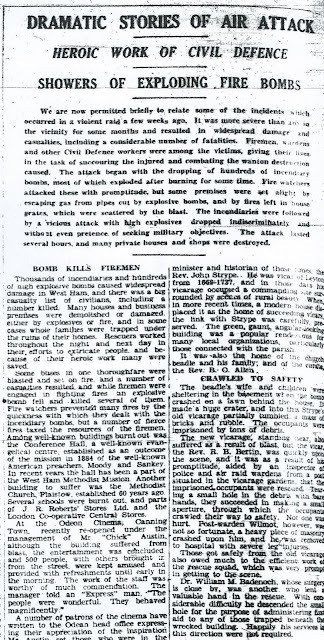 I was probably only living at the Princess Alice for about 4 or 5 months and yet one of the things that made a great impression on my mind was a visit to Wanstead Flats where I saw the Fire Brigade practising. I saw the rainbow in the jet from their hose and how it disappeared into the ground when the water was shut off! Why should that have made such an impression? Prior to being bombed out and going to live at the Princess Alice we went there to see the wonderful new thing called television. The room was duly darkened and the television set switched on but, to everyone's disappointment, nothing came on. Uncle Bert, who was not renowned for his patience, fiddled with all sorts of knobs at the back in vain and finally all attempts were given up. Later, when the evening papers were delivered, it was discovered that all television broadcasts were discontinued for the duration of the war! The television, having been salvaged from the Princess Alice, was, strangely enough, the set on which I eventually saw my first ever television show when broadcasts began after the war.